On behalf of all my running family and team mates, I’d like to welcome you and acknowledge what I think is a great decision to be a part of the Lopers Club and our running family. You’ve taken the first step to accomplish some of your biggest fitness dreams. It is my prayer that my story inspires many but specifically returning members looking to increase their speed and jump to the next level. Running bonds us ALL. Some begin to run for friendship/socializing, to help others, for balance, for fitness, and some are crazy…..just kidding. Whatever the case, the Lopers has a place for you. If you’re looking for more, I want you to know you’re not alone. As you begin to make your move to reach the next level, you’ll probably be filled with certain emotions. They can run the gamut from excitement, to anxiousness, even fear. But when the going gets tough, you have great Pace Leaders to carry you through and there is Speed Training on Tuesday evenings to keep you on track for attaining your running goals. The Lopers have a set of experienced leaders doing all the work behind the scene to make your success possible. 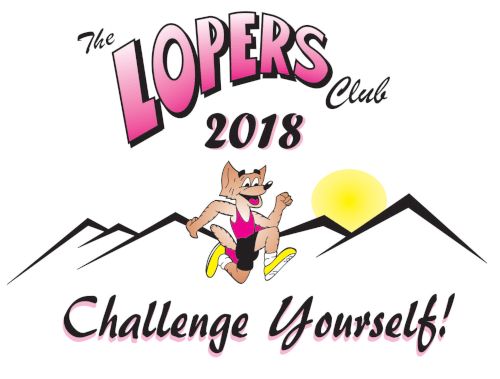 The Lopers Club is one of the biggest running clubs in California with a track record of success. Between the Lopers Speed Training, their leadership, and your determination, I think you have a winning formula to take your running to new heights. There’s no guarantees that it will happen, but if you persevere long enough, the Lopers Club can show you the winning way. Originally I really just wanted to get fit and loose some 35 pounds of tortillas I had gathered through the years. With scoliosis, weight-lifting and soccer were out. But one day, when I sat down to read the local newspaper at the doctor’s office, I found a small ad for the Lopers that said training would begin the following Sunday. Without hesitating, I decided I was going. I found the Lopers Club and running found me. This sport accepted me, has helped me reach personal levels within, has given me many victories, and has also humbled me. My first year I just dove at full speed, making remarkable improvements in my first 90 days. While I will be pacing the 9-minute pace group this year, I vividly remember my first time with the Lopers Club, lining up with the 14-minute pace group years ago. I told myself then that I would finish this running season or somebody was going to carry me off the Loper course!!! Of course, that didn’t happen! I did not wear Loper pink all that season because in my culture, men don’t where pink (or flashy colors for that matter). I think about it now, and it is so funny. Getting almost run over at night can really change your mind about wearing bright colors! People were very friendly and willing to help but at first, I was very competitive and not willing to listen to anyone. I knew everything and had an ego the size of Texas. Thankfully, my love for the sport was even bigger, and I began to listen to Russell Barber, the speed coach, although occasionally giving him a hard time. I made mistakes by treating every run as a race, skipping water stations, and waiting for no one. I had frequent aches and pains due to my impatience because I wanted to be fast yesterday. I spent my first year progressing through each pace group, spending a little time with each of them and acquiring my nickname (Flash). My second and third years with the Lopers were very productive. I gained so much momentum and had 13 consecutive personal records at every distance- I towed the line!! From the 5k to the marathon–it was a BLAST! Going from a 5:45 marathon to a 3:57 marathon in two years blows my mind!! My fourth year was different. I focused on building relationships and giving back to my running community. Through running, I’ve been able to meet some of the most amazing people. I’m truly fortunate. I’ve also had the privilege of coaching others and watching them succeed. It has really been rewarding. Have Fun! A lot of people define fun as drinking and partying. That’s okay, but I decided running was going be my long term “fun”, and I challenged my own view of fun and turned it into running. Run free and run in the moment. Get a coach or get help from a pace leader to point you in the right direction. Think positive–developing a positive, championship mindset is essential to running. Don’t compare yourself to others, but if you do, then compare to the root not the fruit. Have a crystal clear vision on what exactly you want. The road is long and my love for this sport continues to grow. I now look forward to becoming a better version of myself and celebrating others as well as me. This is my story. It’s not indicative of everyone at Lopers, but it is indicative of what’s possible if you apply yourself. There are deficits in hope and optimism in this world, but together we can bring light where there is darkness. Thank you for reading my story. I’m here for you. Let’s lace’m up and leave it all on the road from Start to Finish!